VietNamNet Bridge – As the Lunar New Year begins, spring festivals countrywide are in full swing. Around 50,000 people made the pilgrimage to Huong Pagoda Complex for the Huong Pagoda Festival, which started on Sunday in My Duc District, Hanoi. This is one of the most celebrated festivals in Vietnam with a huge number of pilgrims who visit the pagoda at the beginning of the year, wishing for a happy 12 months. 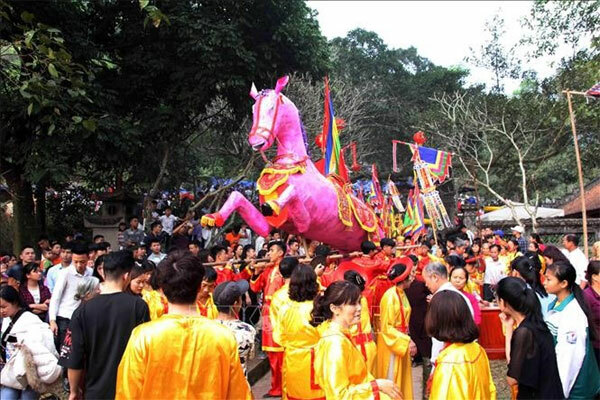 Also on Sunday, the Saint Gióng Festival began in Soc Son District, Hanoi, which aims to honour the legendary hero Giong, who is known as one of the Four Immortals of Vietnam (along with Tan Vien - the God of the Mountain, Chu Dong Tu and the Mother Goddess Lieu Hanh). Legend has it Saint Gióng was born after his mother walked in the footsteps of a giant. At the age of three, Giong suddenly transformed into a giant and fought against the foreign invaders. The king then presented Giong with an iron horse, which promptly chased the invaders out of the country. 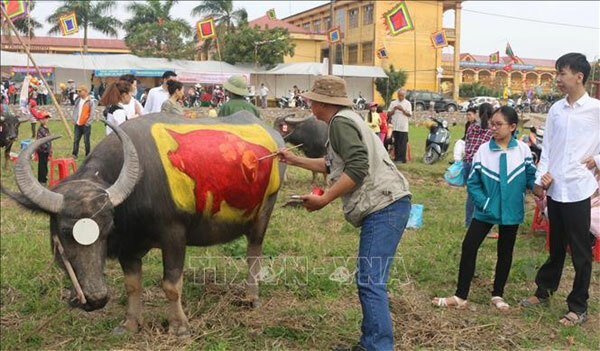 The contest is part of the Tịch Điền (Ploughing) Festival which starts on Monday aiming to commemorate the God of Agriculture and to pray for a year of high yield season and prosperity. Twenty four painters from Hanoi City and Ha Nam, Hung Yen, Ninh Binh and Thai Binh provinces and a Russian painter are taking part. The Festival dates back to the 10th century when King Le Dai Hanh decided to plough in Doi Son Commune in Duy Tien District to encourage rice cultivation. The practice has been observed annually through many dynasties before being faded during the Nguyen Dynasty and was restored ten years ago.